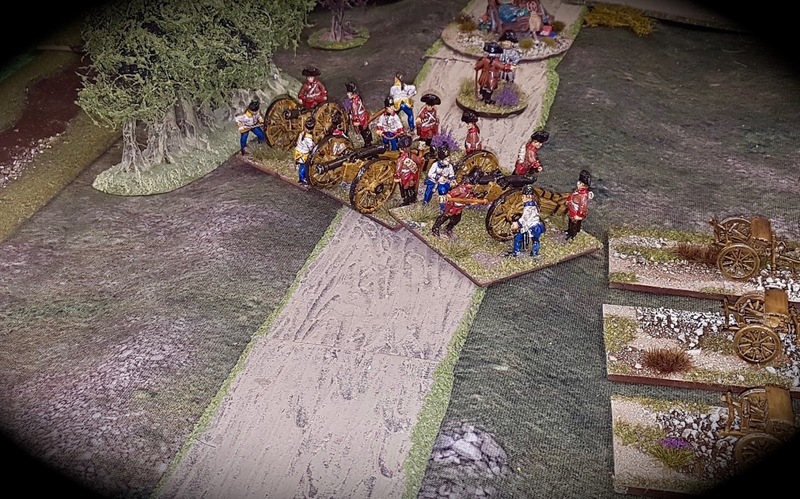 Carryings On Up The Dale: Madame Guillotine will be working overtime tonight! Madame Guillotine will be working overtime tonight! 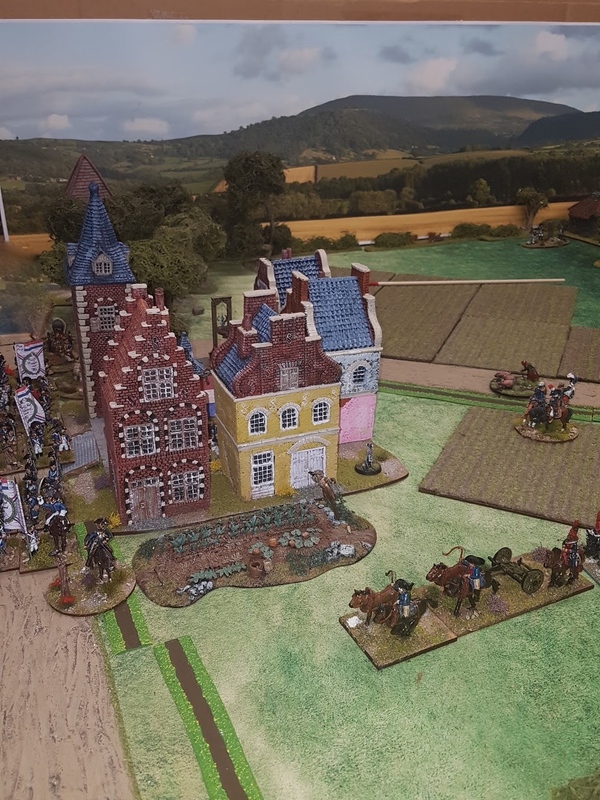 Wednesday saw another game set in Flanders during the French Revolution. The Allies (English, Emigre and Austrians) had lifted the siege of Dunkirk and a rearguard had to ensure the safe escape, via the two roads near the coast, of the bulk of the army before the main French field army closed the net around them. 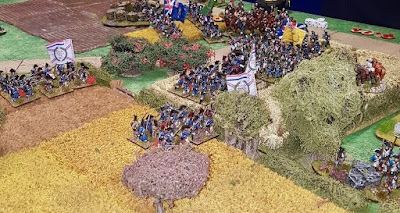 Conrad and Paul S were the Allies and Dave Jarvis and new visitor Jim were the French. 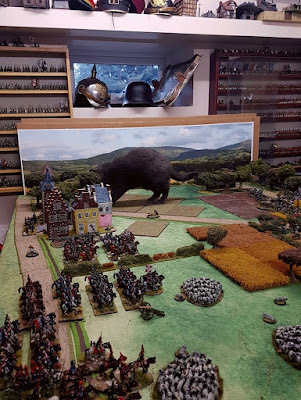 The game started with three brigades of Allies and three of French, and my cat Coco, on the table. As a representative of the Committee of Public Safety she was sniffing out any Royalist sympathisers in the town. The Allies had a brigade of English with an entrenched gun on their right, a brigade of Emigre troops stretched across the centre and a brigade of English horse on the left. 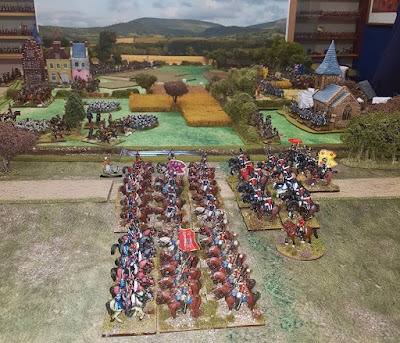 The French advance guard comprised of a demi-brigade legere, a section of horse artillery and two regiments of chasseurs a cheval deployed around the town, and two brigades of cavalry, totalling six small regiments and two sections of horse artillery in the centre. 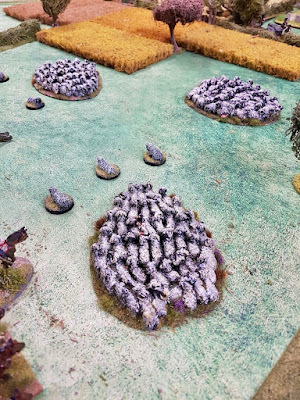 The sheep were neutral. The terrain was to prove to be a nightmare as the battle field was bisected by a dyke and raised roadway, and much of the southern half of the table (north being where the sea is) was covered in standing crops and drainage ditches which would slow movement and provide cover. 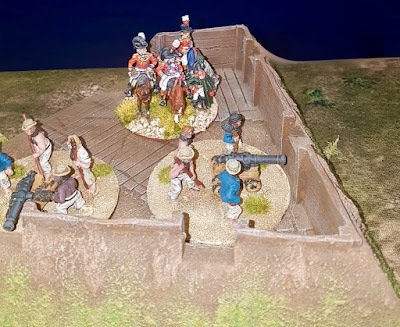 North of the raised road the land was flat and open, with nothing of consequence to get in the way apart from an old French signal tower and a small redoubt manned by the Royal Navy. 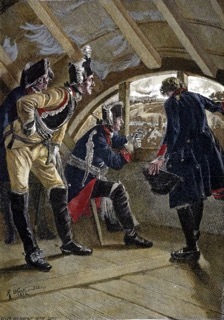 The remaining troops would appear randomly, by picking a slip of paper from a cup. 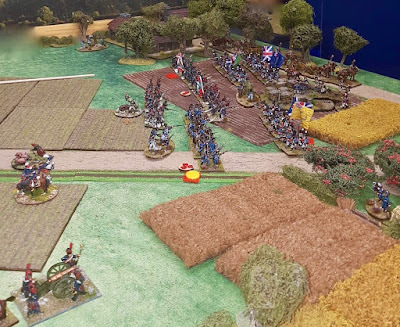 Both sides were mixed together so, as actually happened, the picking side could chose an enemy piece of paper! Or it could be blank. 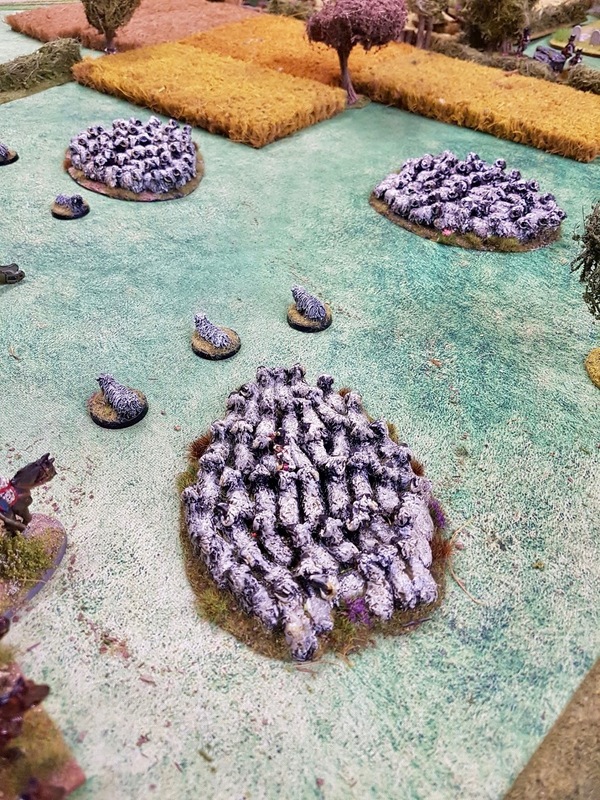 Even the sheep were sending out skirmish screens. The battlefield with the dispositions described above. 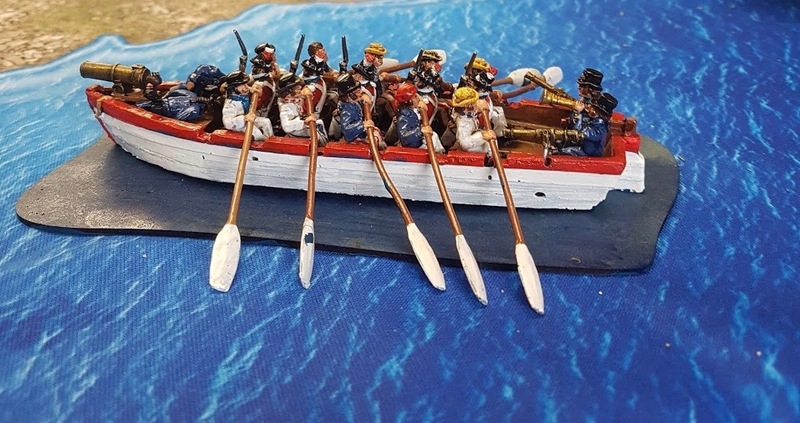 Above and below, the Royal Navy standing by to offer support should it be needed. In the distance the French infantry are moving forward ready to deploy while the horse artillery attached to the cavalry has dashed forward to engage the Emigres lining the hedges to their front. The girl from the opening scene of 'The Duelists' is on the road. 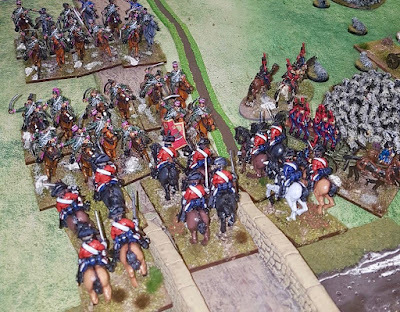 Dave rapidly moved his cavalry across the bridge to face the English horsemen. Not rapidly enough as it turned out. 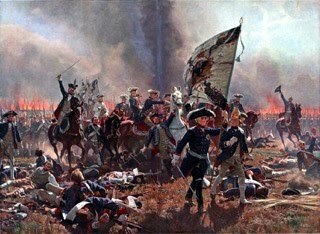 Conrad launched his cavalry forward and charged the French, who countercharged. 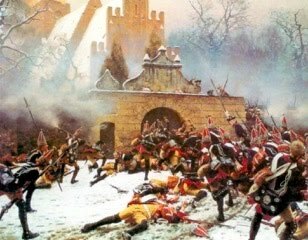 Outnumbered and outclassed the French disintegrated. A sweeping advance by the Household Cavalry hit the flank of Dave's dragoons. 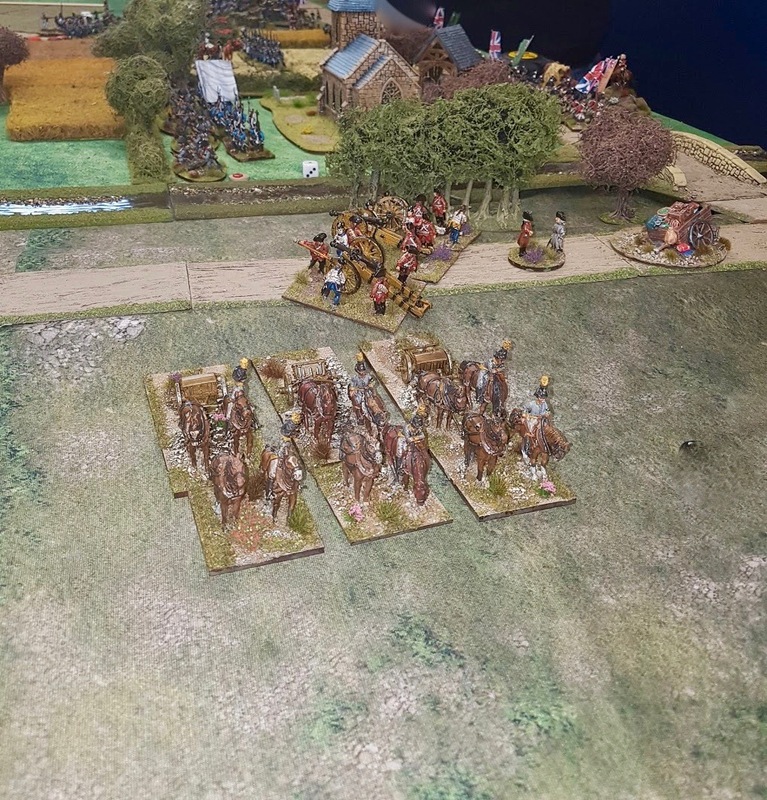 In a very short time all of the French cavalry had been broken, although the English would need to take some time to rally hits off all their regiments. The French on the left have deployed into line but are taking casualties from the English battery. Spurred on by the arrival of a full battery of Austrian artillery and keen to avoid being caught in the open should it chose to deploy to their front, Jim decided to get stuck in and advanced rapidly towards the English infantry. 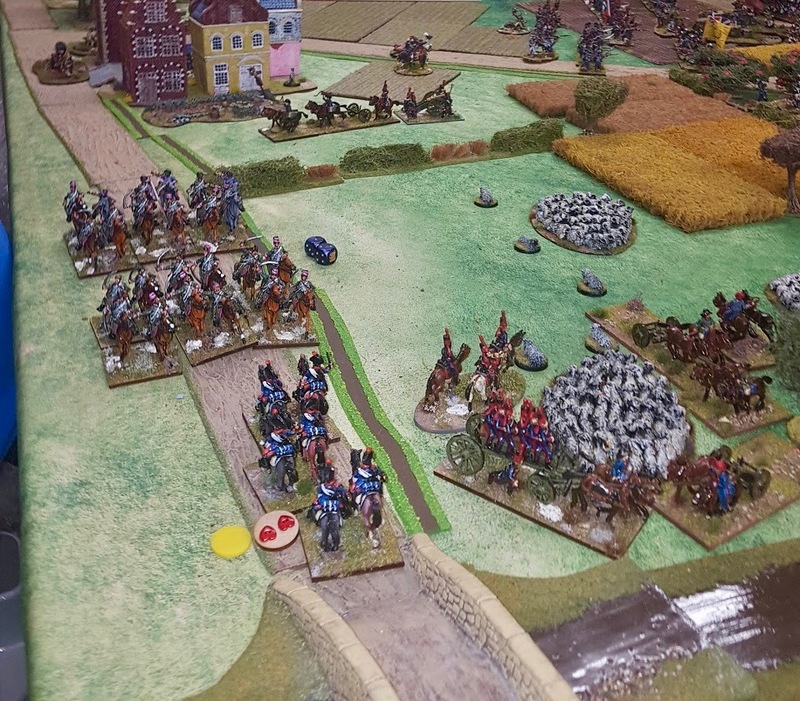 Conrad's reserve were taking casualties from the French horse artillery but were able to drop down into the dead ground behind the raised roadway. 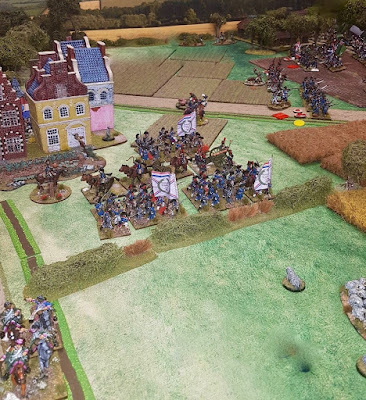 The chasseurs a cheval attached to the advance guard were quickly rushed over to the right flank to plug the gap left by their compatriots. 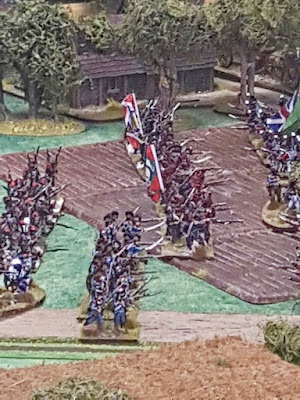 Jim's infantry attempted to close with the English but were held back by close range musket fire and by the riflemen of the Beon Legion in the orchard. 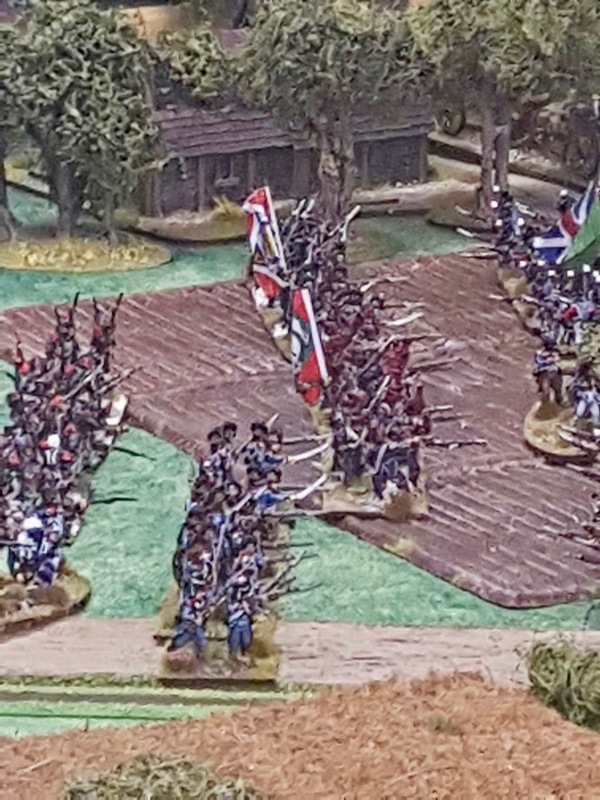 French reinforcements start to arrive, in this case a demi-brigade of newly raised infantry. The reinforcements were thrust forward in support of Jim's now stalled attack. 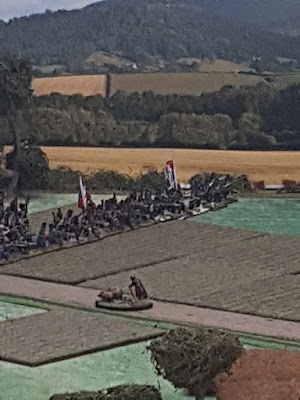 Conrad had meanwhile managed to race his Austrian battery along the baseline road and deployed them on the raised roadway where they would be able to cover the withdrawal of the army. The English cavalry had been busy reforming and rallying hits off for several turns when one still damaged unit, the King's Dragoon Guards, managed to blunder and charged headlong over the bridge into the waiting French cavalry. 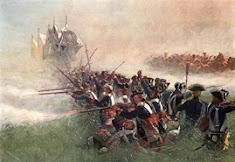 The French only needed to get one hit, which they managed, and the English failed their break test and fled the field. General Abercrombie inspecting the naval gun crews manning the coastal redoubt. Jim's brigade on the left was by now shaken and pulling back, but Dave launched his demi-brigade in a furious assault in the centre. 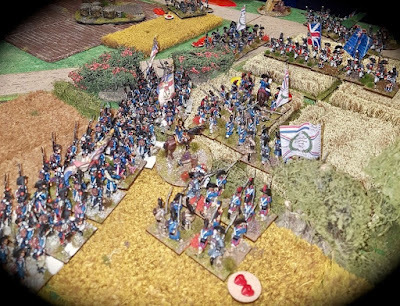 The Emigre's of the Mirabeau Legion were broken and they in turn swept away their supporting English battalion. There was now a rather large gap in the Allied line, with more French troops following up the attack. 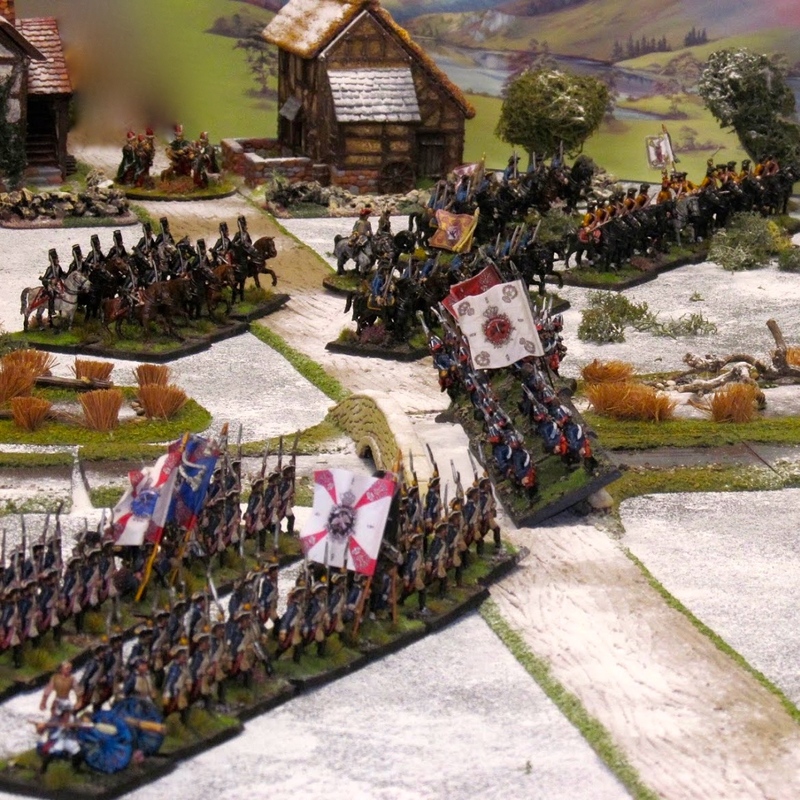 The Rohan hussars charged and forced the leading French battalion into square. The English Guards brigade on the road were in danger of being caught in the flank as a full six battalions of French struggled through the cornfields. 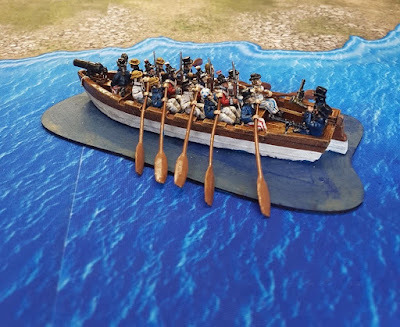 Six more battalions were also in the process of arriving, supported by a battery of 8pdrs. 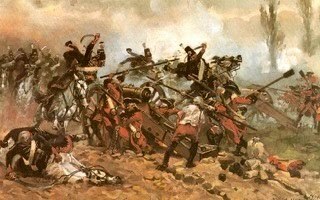 Meanwhile the Austrian artillery had destroyed the remains of the French horse battery facing them. 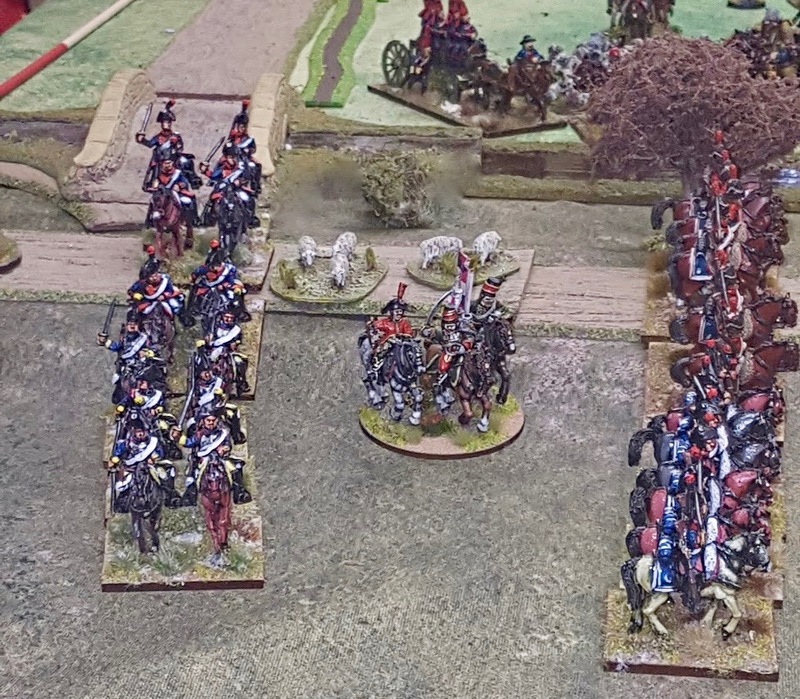 There were now no effective French units in the right half of the table. The massive assault in the centre so nearly drove a wedge into the middle of the Allied line. 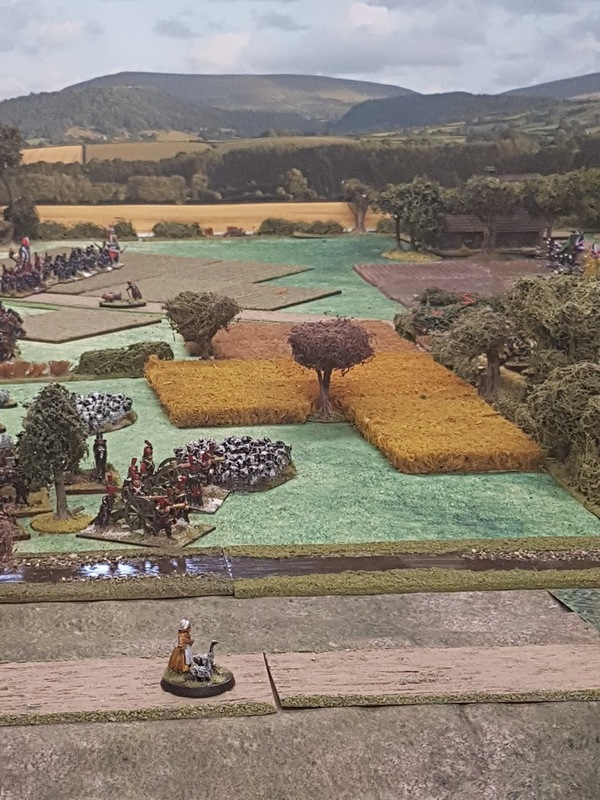 At this point the French attack in the centre ran out of steam as most of the battalions were shaken. 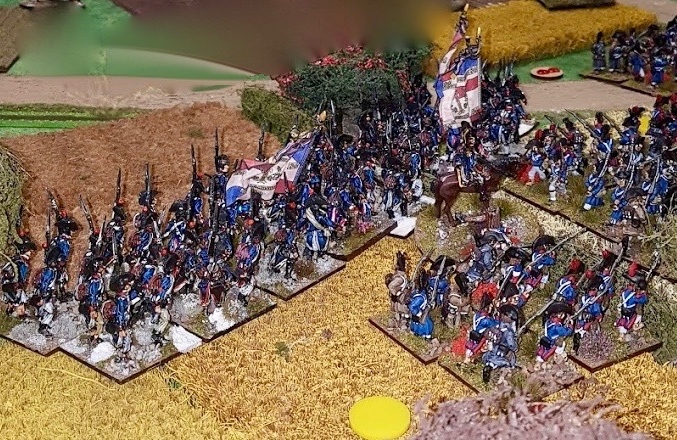 This took the entire French army over their break point so they had to concede defeat. 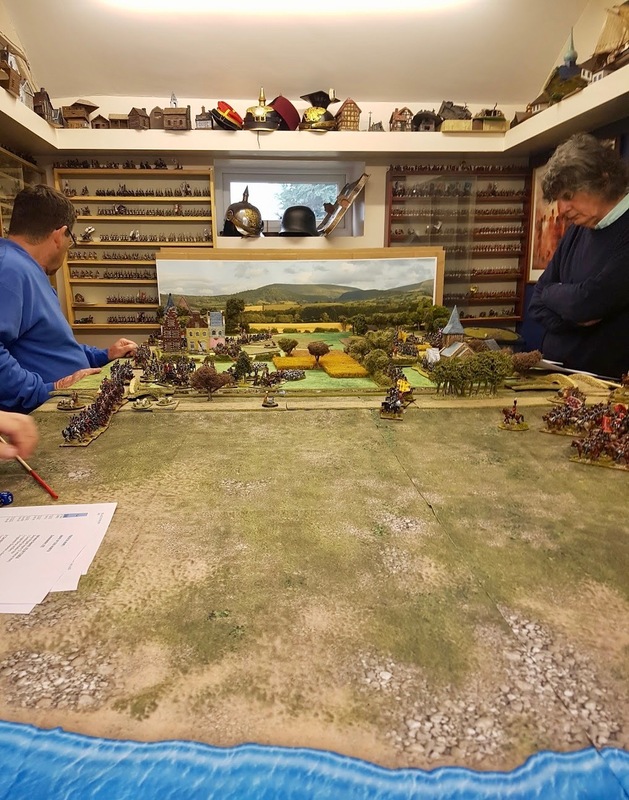 I think the scenario worked very well although it didn't go at all like I had imagined it. 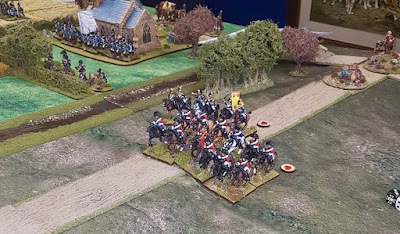 I kind of assumed the French would use their advance guard to pin the Allied rearguard and then launch all their cavalry over the dyke to overwhelm the English horse, followed rapidly by their first reinforcements using the benefits of march column on a road to eat up the inches and position themselves where they could threaten the two exit points. That didn't happen of course. Instead we saw the French advance guard stung into an attack, closely followed by all their reinforcing infantry which headed slowly through the worst possible terrain to get to the Allies. 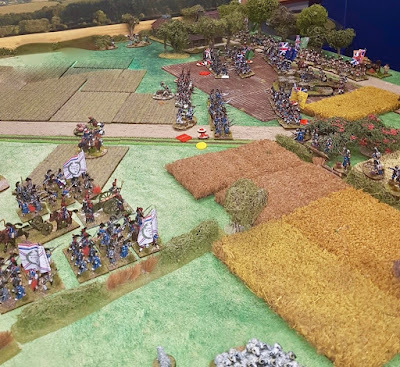 They got bogged down and were unable to use their superior numbers nor were they able to get their field artillery into action. 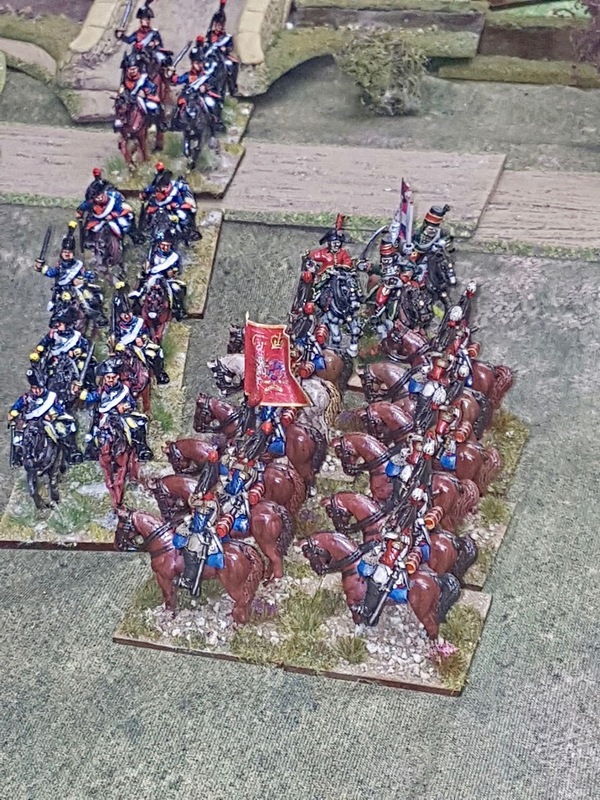 As for the French cavalry, they didn't stand a chance without the two chasseur a cheval regiments, but they did at least put the English horse out of the game for several turns while they reformed. A frustrating but enjoyable game I think. Better go and get the guillotine blade oiled up. 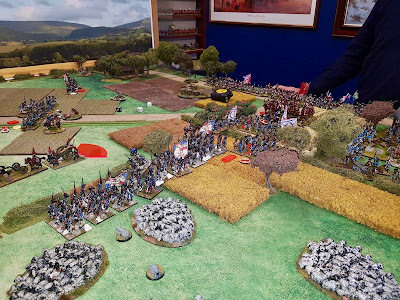 Neat write up and a good looking game Colin. A very entertaining write up. Sometimes the best scenarios are the ones that go in their own direction. Most splendid, it has me all inspired ready for Monday over at GHQ now. 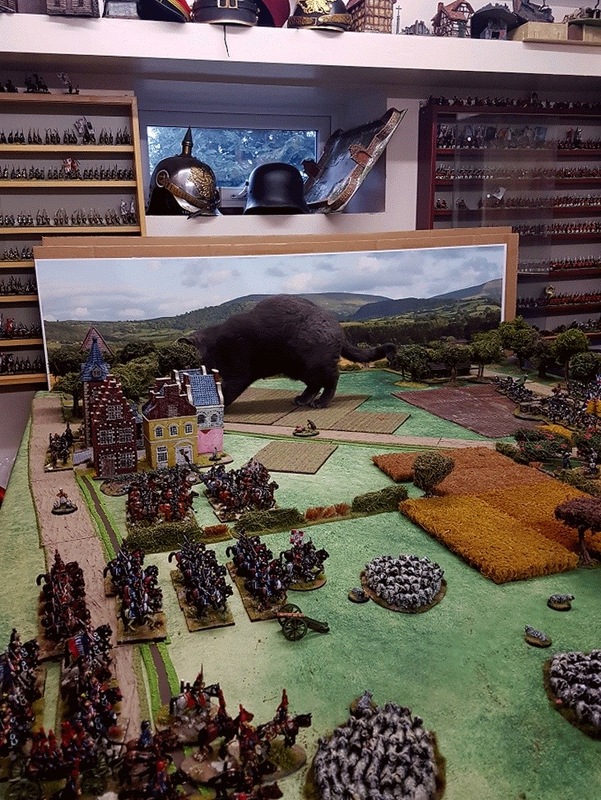 Can I borrow the giant cat, it may help if I play true to form. 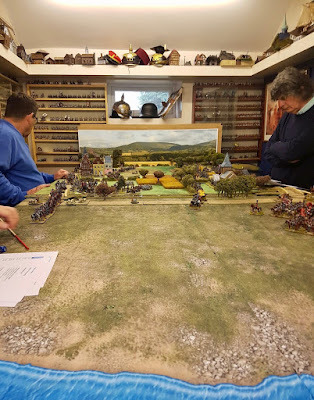 A beautiful and intense game, spectacular pictures! 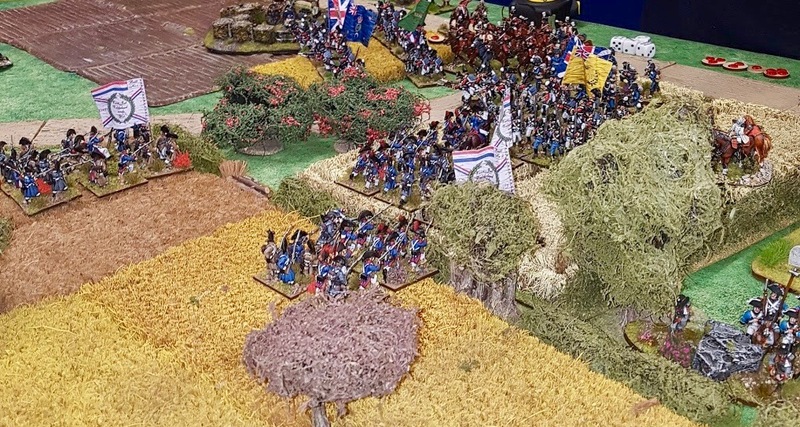 Interestingly, I've just remembered that neither side made any use of their CinCs.to order troops, nor were any follow me orders used. Magnificent game there old bean! The Frenchies never do what one expects, comes of being foreign and eating all that garlic I expect! Lovely game! I wonder though if either Crann Tara or Minden-Fife&Drum might consider producing a cat in 1/56th? That is a lovely table, chock full of interesting and fun things. 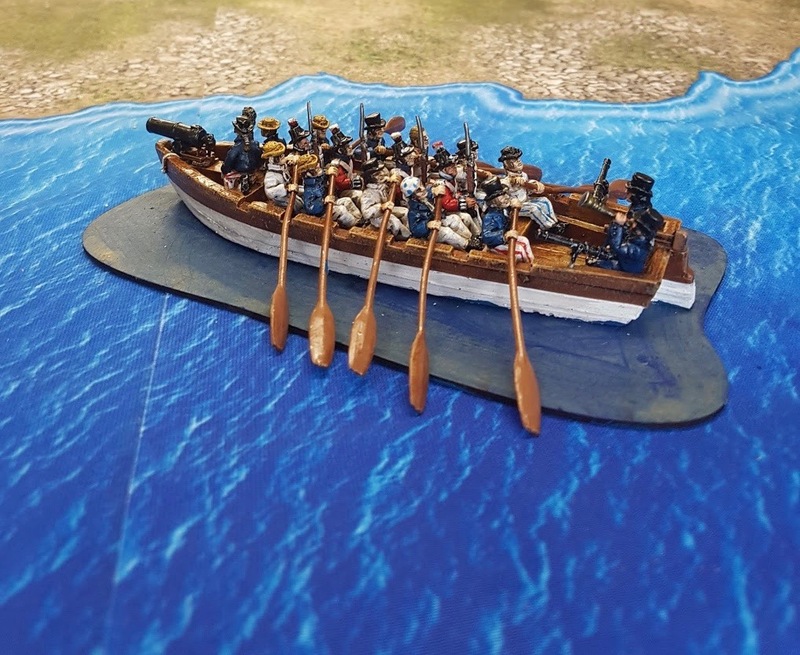 Love the RN boats! And, having once been followed for days by a demonic-looking sheep, your flocks are as scary as Cuirassiers! What a great looking game Colin. 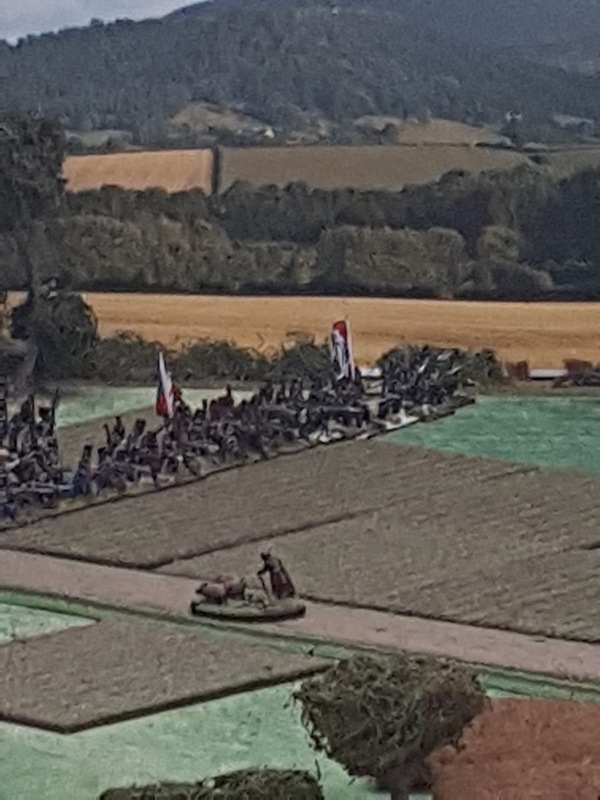 Love the shot of the French advancing across the ploughed fields with the backdrop behind them. Speaking as Citizen-General Jervase, we are GUTTED about the result. We didn't apply enough pressure long enough to make it count. If the Allies had somehow lost, it would have been a travesty - although I would have taken it!! Ah well, no doubt I shall have some explaining to do when I next spear before the Peoples' Committee...!!! Citizen! You will have one last chance to redeem yourself otherwise the Committee will have to take action to protect the Republic. Thank-you, Citizen. Failure is not an option. LONG LIVE THE REVOLUTION! Loved the write and beautiful game. Very inspiring. 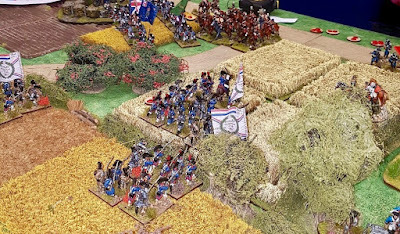 Especially liked the little mini dioramas like the big flock of sheep and especially the girl with the geese (right out of The Duelists). Where did you find the figures?